It’s somewhat easier to stay motivated and stick to your exercise regime when you’re at home – you are committed to a daily routine, your gym is just around the corner, and you’ve normally prepped a fridge full of healthy meals before the week has even begun! However, frequent business travel can make things a little tricky! You’re surrounded by temptation of the belt-tightening variety, gym facilities may be a little harder to access, and your schedule may be so tight that it’s difficult to fit in any exercise anyway. Not so. Here are our top 7 ways to stay fit when travelling for business. If you travel a lot, you’re probably used to waiting. For flights, transits and through Custom’s delays if you’re travelling for business internationally. And unfortunately, that can mean you get hungry and may give in to the temptation of eating a little too unhealthily while you’re at the airport. Food courts are notorious for quick kilojoule overloads, however, even prestigious airline lounges aren’t immune to serving weight-enhancing meals and snacks. If a teensy bit of stress is involved (and let’s face it, business meetings and conferences can rattle even the most resilient of business folk), then you may also succumb to eating unhealthy foods, which means your insulin levels increase and your fat storage levels can be stimulated. One solution? Pack snacks. Travel-friendly nibbles like trail mixes, high protein energy bars and even crackers-and-cheese-on-the-go packs will not only keep the hunger pangs at bay, you’ll be boosting your protein and energy levels as well. Staying fit when travelling also comes down to what you’re eating when you’re actually on your flight. One of the biggest reasons we feel sluggish and tired after flying is that the lack of physical movement means our digestive systems are not processing food as quickly as they normally would. Try to reduce carb-loaded meals like pasta, rice and bread (especially on long-haul flights), and opt for healthier options like soups, vegetables, salads and fish if you can. Reducing your carbohydrate intake can also help to reduce fluid retention, bloating and even jet lag. Long haul flights in particular can involve plenty of snacks and meals regardless of whether your body needs to eat, and are often served at a time when we’d normally be sleeping. This means that the hormones that control our digestive system and fat metabolism are not expecting food, so we’re more likely to store the excessive kilojoules and fat. Try and stick to your regular meal times – for example, if you’re on an afternoon flight, enjoy an early dinner and then try and allow six to eight hours before you eat again. And an obvious one … hydrate as much as possible, and that doesn’t mean with alcohol or caffeinated or fizzy drinks! Aircraft are notoriously dry environments and dehydration can be a major cause of fatigue that can also make you eat more. Keep your appetite in check by consistently sipping on fresh water or herbal teas that will help your kidneys flush out any extra fluids. You may have your workout routine down pat at home, however, things are way less predictable when you’re travelling for business. Research personal trainers at your scheduled destination before you leave home and book in your workouts with them in advance. Also try and schedule them into a time of the day when you know you’ll have an hour or two spare, like first-up in the morning, or at the end of the day. That way you’re already locked in and can enjoy that client dinner or team-building feast, guilt-free! Another useful travel fitness tip is to choose accommodation that has a range of fitness facilities. Most executive hotels these days have fitness centres that cater to business travellers, and others come complete with tennis courts and exercise-inducing lap pools. 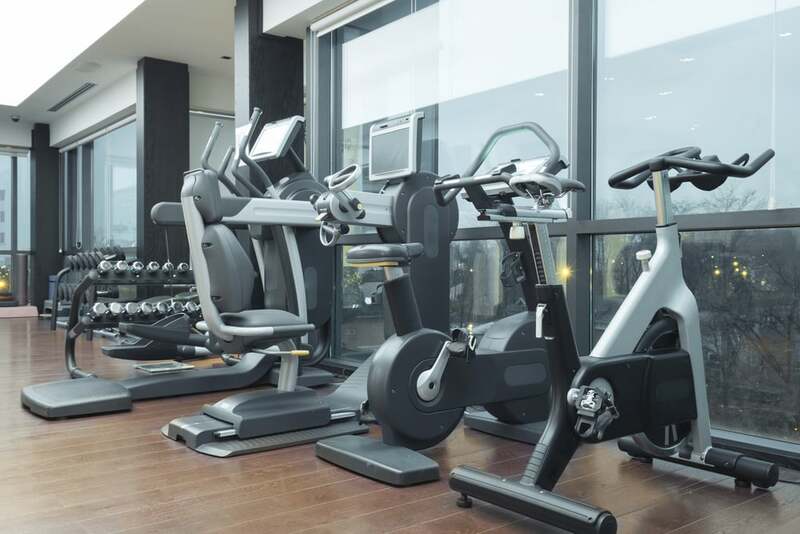 If the budget doesn’t stretch to a hotel with these on-site facilities, consider choosing accommodation that offers free access to health clubs, or is at least located in an area with a gym or fitness centre nearby. Staying in a location that’s entirely fitness-facility-free? Use your room! Bodyweight workouts require virtually no equipment. All you need is floor space, and if you’re limited for time, try implementing your own circuit workout. Warm up with one to two minutes of old-fashioned jumping jacks, then do 15 squats, 15 push-ups and 15 sit-ups. Try and do as many rounds of each as you can in 20 minutes, limiting your rest time between each round. If your accommodation is self-contained, stock up on fresh produce from local markets and plan easy-to-prepare meals similar to what you’d eat at home. Keep the fridge stocked with healthy snacks and resist the temptation to raid the mini-bar or order room service. It’s a no-brainer really. Alcohol and business don’t mix well, particularly if you’re entertaining important clients and a professional attitude is a crucial part of your job. You’re travelling for business after all, not enjoying a decadent holiday! Curbing your alcohol intake will not only lower your kilojoule intake, it will also ensure your willpower’s not compromised, meaning you’ll be more likely to stick to your fitness regime. And just as you did on the flight, hydrate, hydrate, hydrate. Keep a water bottle with you at all times, and if your clients or colleagues do insist on a celebratory tipple or two, substitute every glass of alcohol with a same-sized glass of water. An underrated element of physical health, ample sleep is a key strategy for keeping healthy and staying fit when travelling. With enough sleep, you’ll have more energy, be more attentive and be motivated to exercise, so try and aim for at least seven hours a night. Unfamiliar settings and different time zones can also inhibit your ability to sleep like you would at home, however avoiding caffeine and alcohol, tiring yourself out with exercise and avoiding digital devices before bed will go a long way to ensuring you awake fresh and re-energised in the morning … ready for that next meeting! Exhausted after an energetic business trip? Then you’ll need a comfortable ride home! Contact CitiCar today on 1300 661 119 and hire one of our chauffeured cars today.